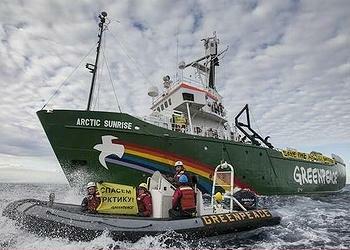 HAMBURG, Germany, November 22, 2013 (ENS) – In a binding ruling, the International Tribunal for the Law of the Sea today ordered Russia to release the Greenpeace ship Arctic Sunrise and the 28 activists and two freelance journalists who were onboard during a September protest of Arctic oil exploration. In the case of the Dutch-flagged Arctic Sunrise brought by the Kingdom of the Netherlands against the Russian Federation, the tribunal ordered that upon the posting of a bond in the amount of 3.6 million euros by the Netherlands the activists, journalists and the ship must be freed. Twenty-nine of the so-called “Arctic 30” have this week been granted bail by Russian courts, but one man, Colin Russell of Australia was denied bail and remains in a St. Petersburg prison. The tribunal also ordered Russia to allow the vessel and the defendants to leave the country. Russian authorities have charged the 30 men and women with piracy and hooliganism, and some of them may be charged with obstructing a law enforcement officer. The arrests and seizure of the ship were triggered by a September 18 Greenpeace protest against the Arctic oil and gas drilling operations of Russia’s state-controlled oil and gas company Gazprom in the Pechora Sea off Russia’s northern coast. Several activists attempted to climb the Gazprom oil platform in protest of the world’s first commercial drilling operation in the Arctic. Saarela is now free on bail. “Greenpeace would not disagree. The law is the law and this ruling goes a long way towards rectifying the great injustice against the Arctic 30 and we welcome it with open hearts. Russia declined to appear before the tribunal to present its case, but the tribunal ruled that this non-appearance did not affect its ruling. Naidoo said the actions of the Arctic 30 did more to help bring public awareness to the dangers of climate change than the UN climate negotiations in Warsaw which wrapped up today with little progress towards a legally-binding universal climate agreement.